Ivan Andrusiak was born in Verbovets, Ukraine in 1968. He studied in the philology department at the Ivano-Frankivsk State Pedagogical Institute as well as at the Ukrainian Academy of Public Administration. In the 1990s, he co-founded with Stepan Protsiuk and Ivan Tsyperdyuk a group called New Degeneration, which had a considerable influence on Ukrainian literature. As a translator, he has rendered several works from Polish, American, English, Georgian and Russian into Ukrainian. Andrusiak has also published several books of poetry, including his latest collections »Book of Grass, Trees and Birds« (2013) and »Hearts of Hand-reared Plants« (2015). In 2003, he published a novel called »Vurgun«. Andrusiak has also published collections of essays and literary criticism. In the past decade, however, he became much more widely known to a broader public as the author of children’s books. For example, »The Third Snow« (2014) is the absurd and funny story of a blackbird named Mark who steals honey from bears as part of an experiment, prompting a wolf named Meletiy to investigate the theft. A hedgehog named Peter provides Mark with a safe place to hide during the investigation. Meanwhile, the bears are captured by humans looking to sell them to a zoo. The animals come together in solidarity and succeed in saving Helena, a young bear with an eye injury who learns to read Braille with the help of her friends. »The Third Snow« made the Long List of the BBC Children’s Books of 2014. »Chupacabra and Other Bunnies. The Sweeter and Sweeter Garden« (2014) contains two collections of poetry: the first is full of biting wit and hilarious pranks, and the second uses poetic images to tell the story of a father who goes on walks with his young daughter. In »The Bunny’s Christmas«, a small bunny suffers from the cold and darkness of winter, whereupon Saint Nicholas brings him a sunny gift as an antidote to the bad weather so that the bunny can spend a happy Christmas together with its friends from the forest. At the festival in 2016, he will present his recent book “Stefa and Chakalka”. 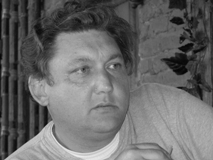 Andrusiak’s work has received several prizes and been translated into twelve languages. In 2013, »Eight days of Burunduk’s Life«, a humorous and empathetic take on the problems facing school-age children today, made it to the list of the renowned »White Raven« catalogue of the best children’s books worldwide. Andrusiak is a member of the International PEN Center and also a member of the management team at the Fountain of Fairy Tales publishing house. Ivan Andrusiak lives in Berezan, Ukraine.